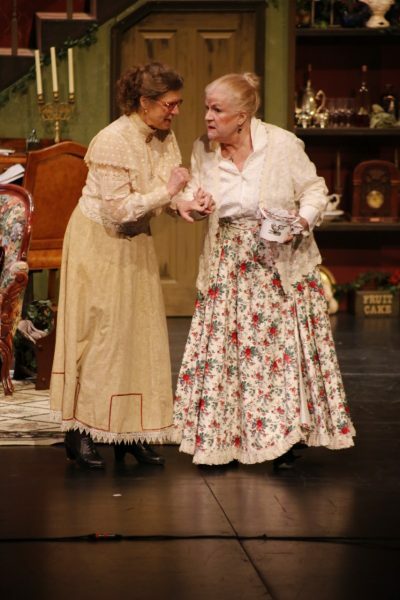 Catherine Lyon as Martha Brewster and Beth Hughes-Brown as Abby Brewster in ‘Arsenic and Old Lace’ at The Arlington Players. Photo by Bermet Sydygalieva. “Arsenic and Old Lace” is like an old friend—comfortable, cozy, known. It’s not going to offer any surprises, but you hope the ride will be fun. ‘Arsenic and Old Lace’ is like an old friend . . . The Arlington Players do it justice. For the most part, The Arlington Players fulfill that wish and do it justice. They are obviously having a good time on the stage, the sets and costumes are truly extraordinary, and the show moves very smoothly. The story concerns a family in Brooklyn that is a tad eccentric; one might argue that families descended from the Mayflower often are, but these whimsical tendencies take a decidedly homicidal turn. The aunts, Abby and Martha Brewster, are still wearing Edwardian dress and making their elderberry wine (the story is sent around 1942), and mercy-killing (in their view) lonely, elderly bachelors or widows. Their brother Teddy believes he is President Theodore Roosevelt and behaves accordingly, including digging “locks” in the basement (the Panama Canal) which is useful when disposing of bodies. Mortimer is the mostly sane nephew and he has stayed in New York while his brother, whom everyone is afraid of, left the city a long time ago. Mortimer is a drama critic who must decide whether to marry his fiancée, Alaine Harper (daughter of the minister that lives next door); he is afraid he carries the Brewster taint of madness and that it might be nobler to set Elaine free. The play takes place over the course of one insane night, and we have bodies, missing brothers and their accomplices turning up, the police popping in and out and lots and lots of tea and food, along with that deceptive elderberry wine. “Arsenic and Old Lace” is a farcical black comedy revolving around the Brewster family, descended from the Mayflower settlers, but now composed of insane homicidal maniacs. The hero, Mortimer Brewster, is a drama critic who must deal with his crazy, homicidal family and local police in Brooklyn, New York, as he debates whether to go through with his recent promise to marry the woman he loves, Elaine Harper, who lives next door and is the daughter of the local minister. He doesn’t want to take a chance on passing on the family madness. The cast is up to the challenge in this mélange of slapstick, farce, and whimsy. The cast includes: Beth Hughes-Brown as Abby Brewster; Joseph Le Blanc as The Rev. Dr. Harper; Tom Schiller as Teddy Brewster; Michael Neuman as Officer Brophy; Ali Cheraghpour as Officer Klein; Catherine Lyon as Martha Brewster; Lindsey June as Elaine Harper; Richard Isaacs as Mortimer Brewster; Charles Palmer as Mr. Gibbs; Matthew Wise as Jonathan Brewster; Michael Wong as Dr. Einstein; Eric Kennedy as Officer O’Hara; Anthony Pohl as Lieutenant Rooney; and Bob Thompson as Mr. Witherspoon. From the first moments of slapstick as the officers inform the audience of their rights and responsibilities to the final sly twist orchestrated by the sisters Brewster, the actors are fully in the spirit of the evening. The effort is sumptuously assisted by the set design, the painting and the props. It does harken extraordinarily back to earlier eras and at the same time feels somewhat familiar. Among the notable pieces are a print of a Renoir and two beautiful silhouettes, which were in vogue from about the turn of the century to the 1950s. The period touches are everywhere but without overwhelming the set in tchotchkes. The set was designed by Nicholas Queyrane; properties design was by Charlene Sloan, and the set dressing was a collaboration of Liz Mykietyn and Charlene Sloan. Costume design was by Robbie Snow. The materials, lengths, and period touches were spot on and added to the feel of settling in for a well-loved story. Liz Mykietyn was the director. Her direction shows a lot of respect for the source material, which may have led to an occasional lull. Running Time: Approximately two hours and 15 minutes hours with one 15 minute intermission. “Arsenic and Old Lace” runs from February 1-16, 2019, by The Arlington Players, performed at Thomas Jefferson Theatre, Arlington, VA. For more information, please click here.